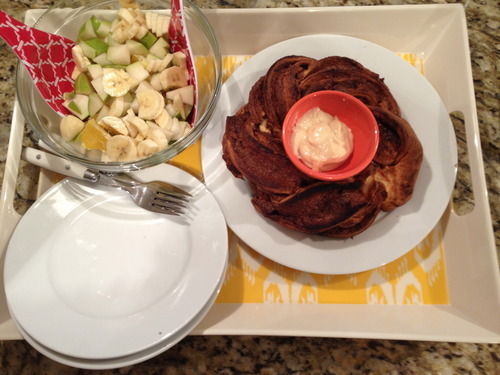 As you may have noticed, I love to make breakfast items. This may have to do with the fact that brunch is my favorite meal, but really I just love having delicious smells in the apartment on Sunday mornings. The following is one of my most recent endeavors. And I have to say, it was one of the messier ones. I tend to find a lot of my recipes on Pinterest. I love this because it helps introduce me to new things that I wouldn’t otherwise think of. But there is a downside – people always manage to show perfect, beautiful pictures of their items, and this is not always easy to recreate. As many of you may have learned, a lot of the work in baking is not pretty, and quite often, your items do not end up quite as pretty as the ones in the picture. But this is ok. You have to learn to just keep going, because quite often, it all works out in the end. For me, this was one of those situations. The bread was delicious, but I struggled to get it to look as nice as the recipe I adapted. But here’s the good news, it doesn’t matter. What matters is that those you’re sharing it with, enjoy it. So go on, get flour on your hands and apron, and make a mess of your kitchen! 1. To get started, mix the yeast, sugar, and milk in a bowl. Let it sit for five to ten minutes until it has foamed up. To mix the next ingredients, you can do it in an electric mixer, but I tried this and it worked much better to do it by hand. So if you can, I would do it in a big glass or plastic bowl. 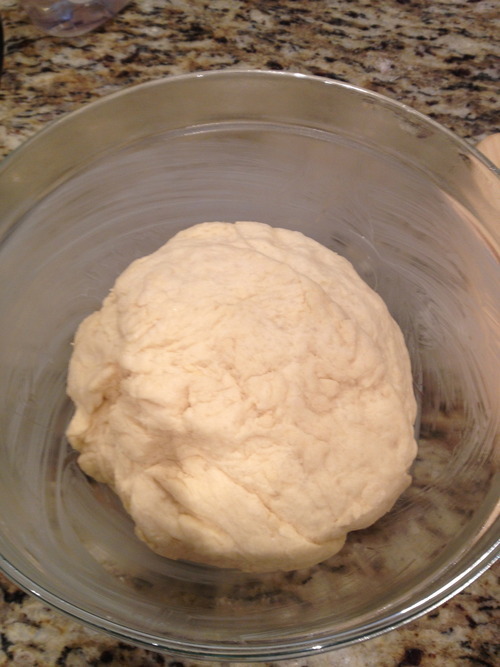 You’ll want to add the egg yolk, melted butter, and flour to your yeast mixture and knead until it forms into a ball. 2. Once you have a cohesive ball, put the dough in a buttered bowl, cover with plastic wrap, and let it rise in a warm area for about one hour. You’ll know its done when it’s doubled in size. 3. Once the dough has doubled in size, preheat the oven to 400 degrees. 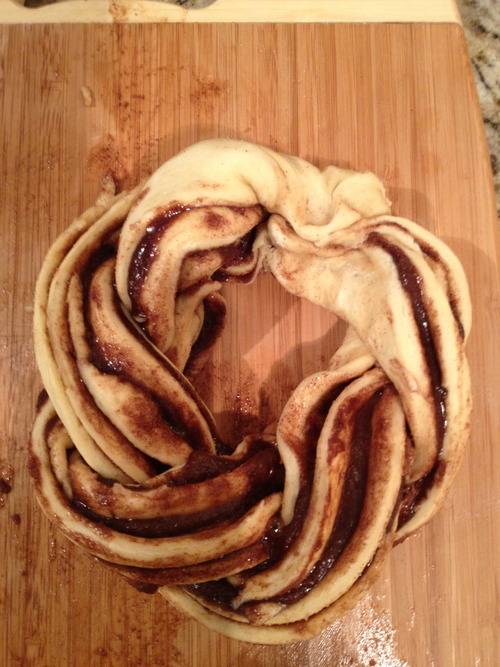 Now you want to roll the dough out. I would use a wood cutting board, or just your counter, and dust whichever surface with flour. 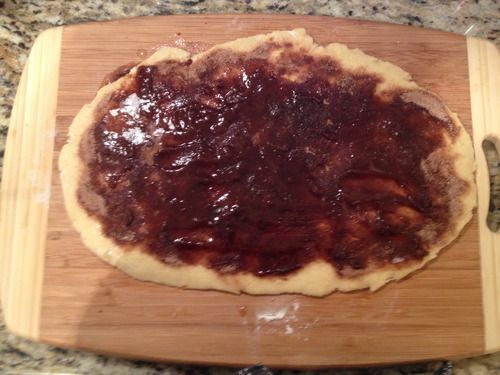 You’ll want to use a rolling pin to roll the dough into a rectangle. Mine was about 15 inches by 9 inches. 4. 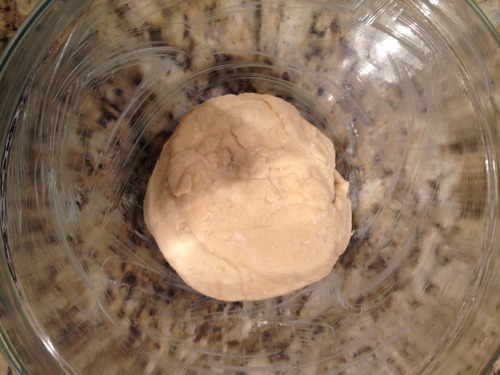 Once the dough is in the rectangle, spread the 1/4 cup butter on it. The recipe I used said melted butter, but I would use room temperature butter. 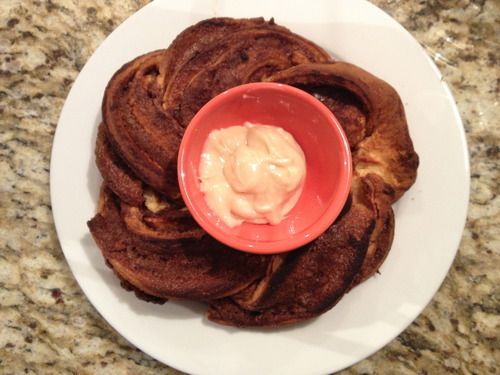 The melted butter made a mess – as you can see in my pictures. 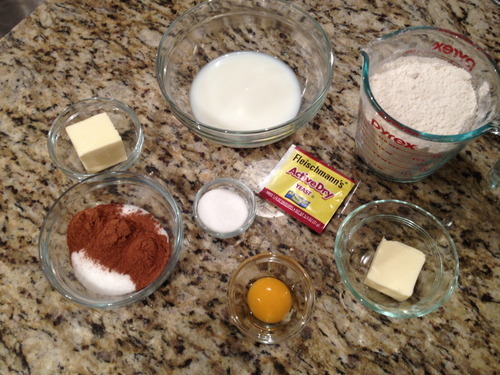 Now mix your sugar and cinnamon in a bowl, and then sprinkle this mixture on top of the butter. 5. 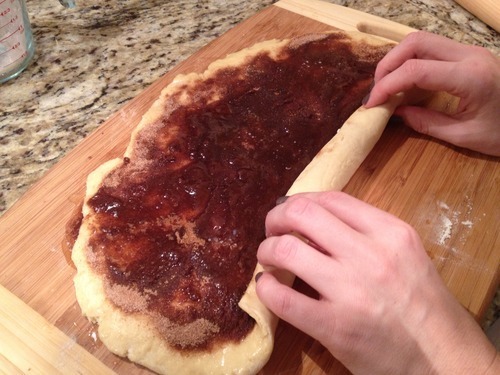 Now, roll up the dough (lengthwise) as tightly as you can. 6. 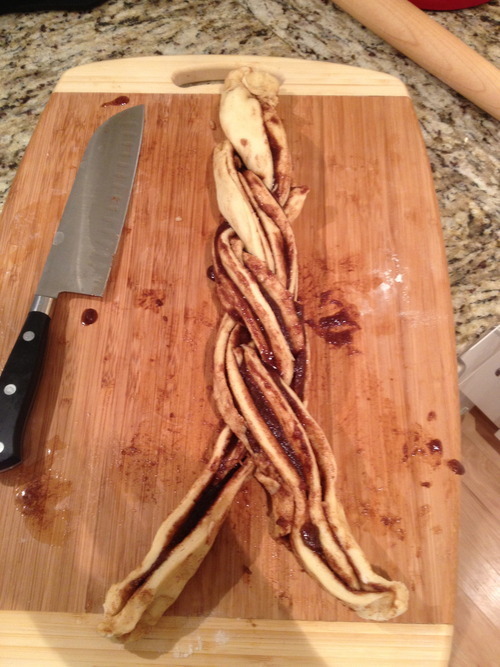 Once the dough is rolled up, use a knife to cut it in half lengthwise. Then push the top of each piece together. This will set you up to do a sort of braid (really you’re just putting one piece over another until you’re done). One note, you do want to do it so that the open part (the part where you see all the filling) is on top and thus visible. 7. 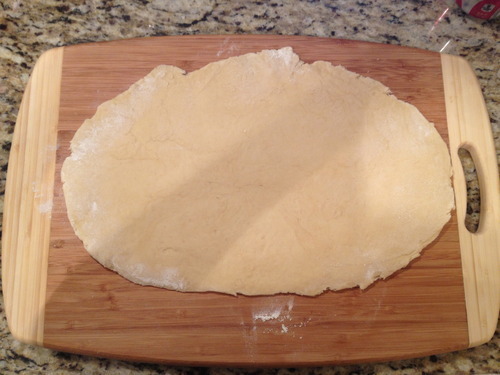 Once you have finished, shape the dough to create a circle. 8. Now you want to put the bread on a buttered baking sheet (or one with a silicone liner) and bake at 400 degrees for ten minutes. After ten minutes, reduce the temperature to 350 and continue baking for another 20-25 minutes. 9. While it is baking, I would recommend making a cream cheese frosting. This is definitely not necessary, but I made a little bowl of frosting for people to dip the bread in. 10. Now enjoy. And again, I apologize for the messiness of my photos. But hey, it tasted good.